Water Innovation Tour attendees, from right, Nancy Stoner, Environmental Protection Agency (EPA), Jeff Eger, Water Environment Federation (WEF; Alexandria, Va.), Matt Ries, WEF, and Jeffery Lape, EPA, listen to a presentation at the University of South Florida (USF; Tampa). Photo courtesy of Aimee Blodgett/USF. On March 27, Water Environment Federation (WEF; Alexandria, Va.) leaders joined U.S. Environmental Protection Agency (EPA) leaders to attend the Water innovation Tour at the University of South Florida (USF; Tampa). Jeff Eger, WEF executive director; Matt Ries, WEF chief technical officer; Nancy Stoner, EPA Office of Water assistant administrator; and Jeffery Lape, EPA Office of Science and Technology deputy director, formed a delegation for the tour. 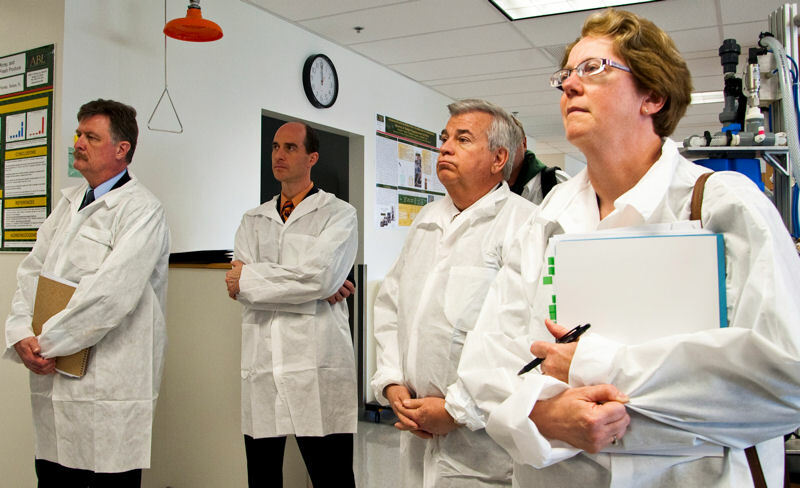 The delegation visited three laboratories to learn about innovative technologies produced at the university. The tour showed the “linkage between EPA and WEF” and how both organizations are working to promote innovation in the water sector, Ries said. Yeh explains how insiration for his research came from WEF’s magazine, Water Environment & Technology. An image of the magazine’s cover is displayed in his laboratory. Photo courtesy of Blodgett. WEF works to help develop and implement innovation. 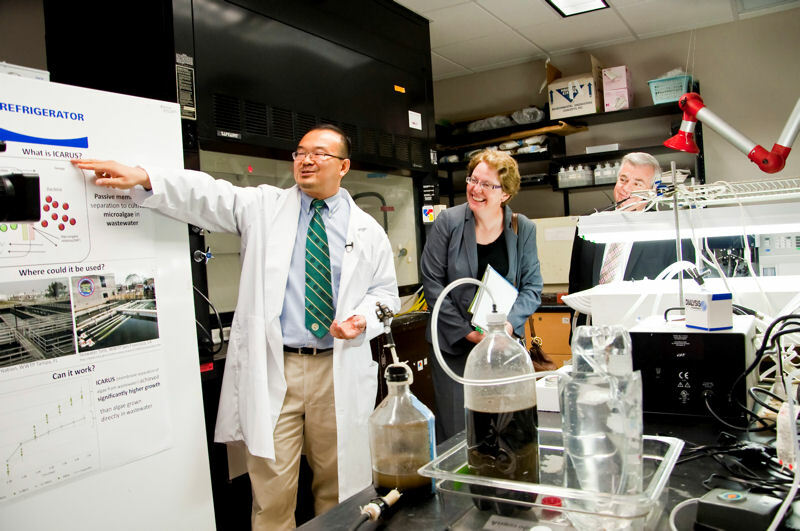 During one stop on the tour, Daniel Yeh, USF associate professor of civil and environmental engineering, explained that inspiration for his research came from the June 2004 issue of the WEF magazine Water Environment & Technology — specifically, from an article on using a membrane bioreactor (MBR) to address the global water crisis. 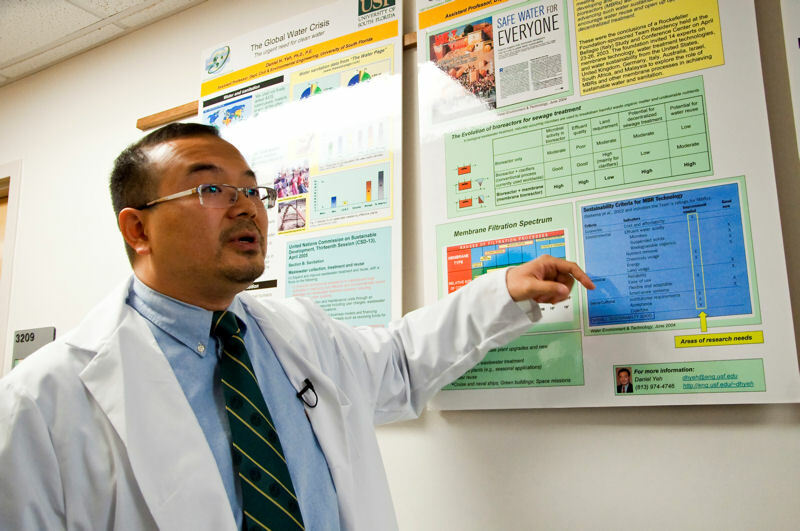 The article was released while Yeh was transitioning from his postdoctoral post at Stanford (Calif.) University to his current position at USF, he said. “The WE&T article on the Bellagio Principle, where water experts gathered to evaluate the merits and limitations of the MBR for solving the global water crisis, has inspired my work for the past 9 years,” Yeh said. The article described barriers to widespread application of MBR technology and helped provide focus to Yeh’s research, he added. He even has an enlarged image of the magazine cover in his laboratory. During the tour, Yeh presented his team’s NEWgeneratorTM, which converts wastewater into nutrients, clean water, and energy. The Bill and Melinda Gates Foundation (Seattle) is funding this research through the Grand Challenges Explorations competition. Based on the anaerobic MBR, the decentralized process aims to provide onsite sanitation and health improvements that are low in energy, maintenance, and costs while enabling resource recovery. The technology has advanced to pilot-scale testing, and commercialization is being planned. Next, the technology will be deployed in a developing country, either in Africa or Asia, Yeh said. Tour attendees also learned about the lab’s work to integrate wastewater treatment and algae biofuel production through the Isolated Cultivation of Algal Resources Utilizing Sewage process. Researchers are exploring the use of membrane technology to incorporate microalgae cultivation directly within the wastewater treatment process to generate biofuel cost-effectively while reducing the cost of treatment, Yeh said. Daniel Lim, a professor in the USF Department of Cell Biology, Microbiology, and Molecular Biology, presents the Portable Multi-Use Automated Concentration System desigend to concentrate mircoorganisms and other particulates from large volumes of water. Photo courtesy of Blodgett. 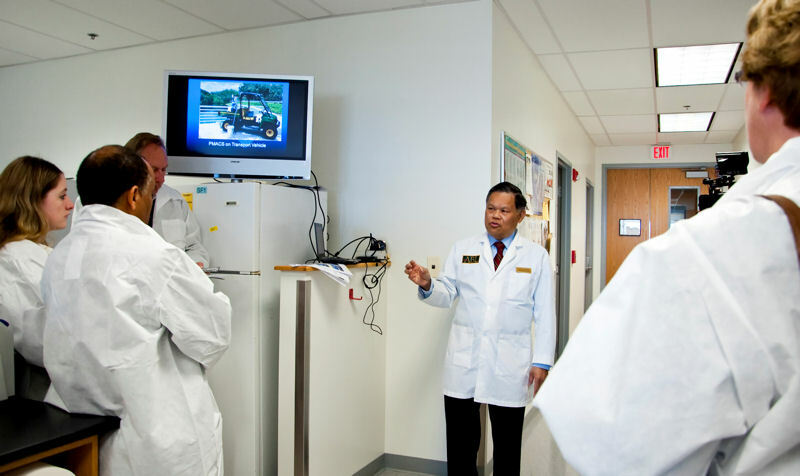 The delegation also visited Daniel Lim, a professor in the USF Department of Cell Biology, Microbiology, and Molecular Biology. Lim explained the Portable Multi-Use Automated Concentration system (PMACS), a patent-pending, portable technology designed to quickly and automatically concentrate microorganisms and other particulates from large volumes of water, Lim said. This device creates concentrated samples of pathogens from waters in which levels initially were too low to be detected by commercially available instruments and assays, Lim explained. It could prove useful to monitoring contamination of natural waterways, water sources, beaches, or other recreational waters, as well as cooling-tower or reclaimed water, Lim said. The system also could help track the source of bacterial contamination, he added. “The event … was important because it demonstrated to them that the PMACS is more than a laboratory prototype, it is a working technology that has been licensed for commercialization and has been field-tested in real work applications,” Lim said. 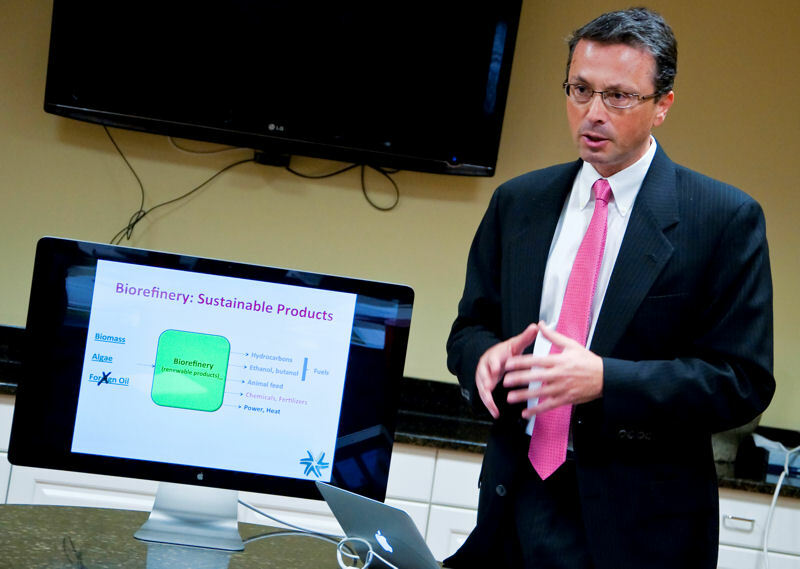 George Philippidis, associate professor in the university’s Department of Chemical and Biomedical Engineering, describes producing renewable fuels while reducing water and energy consumption. Photo courtesy of Blodgett. Also during the tour, the delegation visited George Philippidis, associate professor in the university’s Department of Chemical and Biomedical Engineering. He described producing renewable fuels while reducing water and energy consumption, and his technology to more efficiently use resources to grow fuel-producing algae. “We had a chance to discuss how renewable transportation fuels … can be produced with minimal impact on water usage in local communities,” Philippidis said. “We grow algae outdoors in our floating platforms, whose innovative design enhances the use of carbon dioxide and nutrients by algae,” Philippidis said. This enables algae to use carbon dioxide and nutrients more efficiently, increasing algae production for biofuels, he added. Philippidis shows tour participants the process he developed for growing algae in floating platforms to increase production of biofuels. Photo courtesy of Blodgett. The 51-mm-thick (2 in.-thick) platform is much thinner than conventional systems and reduces the amount of water and energy used for the process, Philippidis said. Currently, he and other researchers are scaling up the system to 0.1 ha (0.25 ac), “which is the first step toward commercial development,” he said. Ries explained that this blueprint shows that both EPA and WEF share a similar mission to further implement innovation in the water industry. Joining together on the tour shows that the two organizations can work together on this mission, he added.